French Pass looking across to D’Urville Island at its narrowest point from the mainland. French Pass is a most beautiful and rewarding location. 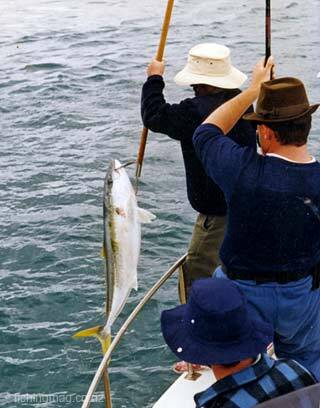 It is a top spot for yellowtail kingfish. For those of you fishing it for the first time, it can be quite daunting. That’s good, never lose that respect, for although it is a very productive area to fish it is not to be taken lightly and can be dangerous. Enormous forces are generated there and while engrossed in the excitement and heat of the moment when ﬁshing, should you let your guard down for a moment you may receive at the least a very bad fright and potentially a fatality. 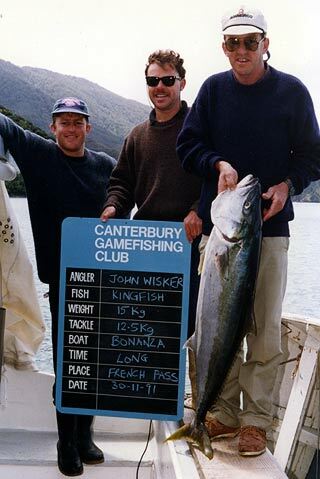 Keith Wood with a solid looking kingfish taken at Fresh Pass, D’Urville Island, in the outer Marlborough Sounds. A top spot for kingfish! Photograph: Allan Burgess. There are two main passes to traverse the waterway, the first being the obvious 100-metre wide channel between the lighthouses on the southern side of the passage. This has the main water flow and therefore the greater turbulence. Approach with caution and observe for a period of time the flow directions and location of the greatest disturbance. Careful observation will show that there are areas where the flow is least and may generate back eddies with minimal disturbance. Use these to avoid the heaviest disturbance. Divert away from the main flow as soon as possible; vortexes and whirlpools can appear unexpectedly and without warning. To enter these can deflect craft sideways with enough violence to cause the occupants to be flung out. All crew should be braced and hanging onto strong handholds on the boat when passing through the Passage. The other passage is nearest to the D’Urville Island side and is known as Fisherman’s Passage. This is considerably narrower and while it is navigable should not be negotiated without some experience in the area first. 1. SAFETY Should you have a motor breakdown you will drift onto the reef before your anchor has time to grab plus rescue causes considerable danger to other parties. 2. PRACTICALITY Should you hook up on a fish, it is not possible to fight it whilst making headway against the current. It will immediately take you downstream onto the reef and bust off. On a south-west flow (incoming tide), fish the Fisherman’s Passage on the southern side. This is the most productive area of the whole Pass. 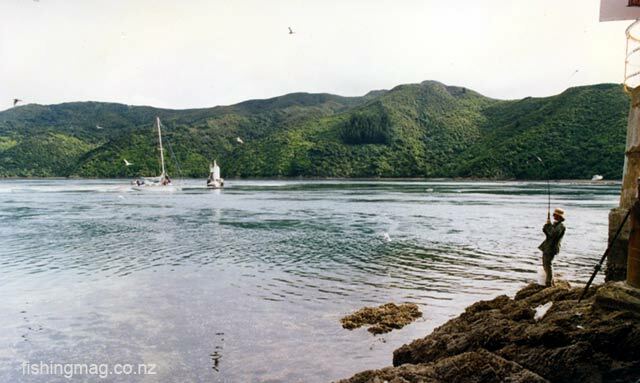 There is a retro eddy which peels off from the main southerly ﬂow and sweeps into the small bay on D’Urville Island. It is safe to allow the boat to be swept downstream away from the Fisherman’s Passage while fishing this flow. After about 150-200 metres you will generally find that the boat curves into the small bay and heads back up to the Passage again. This is generally known as The French Pass Waltz. 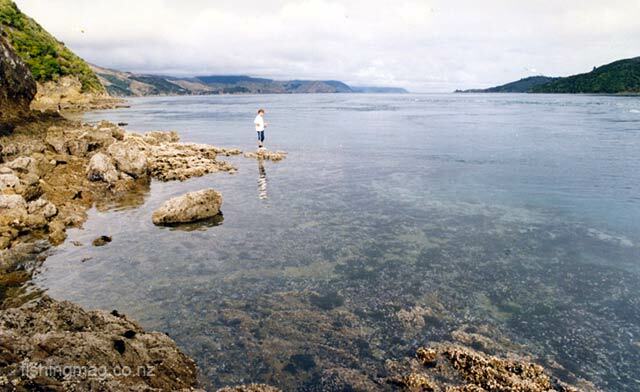 View to the south-west from French Pass across the Current Basin towards Tasman Bay – D’Urville Island is to the right of the picture. Photograph Allan Burgess. This manoeuvre is quite safe and several boats may participate simultaneously provided you follow a basic and accepted protocol. 1. Do not inject yourself over the top of other craft, enter from the downstream side and allow the current to dictate your position within reason. 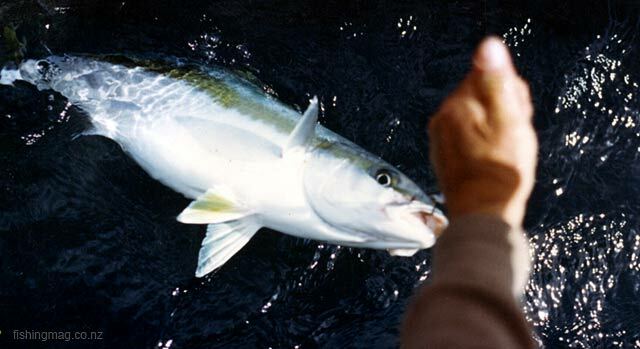 The author with the gaff lifts a big kingfish aboard after it was hooked on a jig in French Pass. 2. Do not cast over other lines or allow your line to drift out and away from your boat too much as this will snag the bottom or other lines. 3. Expect some entanglement with others and co-operate. Do not allow your jig to loiter too long near the bottom as there are considerable amounts of Sea Tulips which eat jigs. If you hook the bottom, expect to break off quickly. Do not motor up on it trying to free it as other boats will be drifting down onto you. Making your own jigs and sinkers. 4. Your outboard motor may be switched off once you are comfortable, with the circular motion of the eddy. Be prepared to start it quickly though as boats may occasionally be swept together very quickly and need reversing apart. 5. If you hook up, allow your boat to drift out downstream away from the other craft. Do not try to winch the fish in too quickly as it will panic even more and break you off on the bottom near the Pass where there is considerable foul ground. Gentle treatment initially will allow you to drift downstream to calmer and deeper less congested water where you will have more chance of landing it. 6. Provide other anglers with a wide berth if they are hooked up; definitely, do not cast near another’s fish. On the northerly or ebbing flow, a larger area is fishable; however, it has considerably rougher water. This side has some huge pressure waves and can easily swamp most trailer boats. Treat with extreme caution! 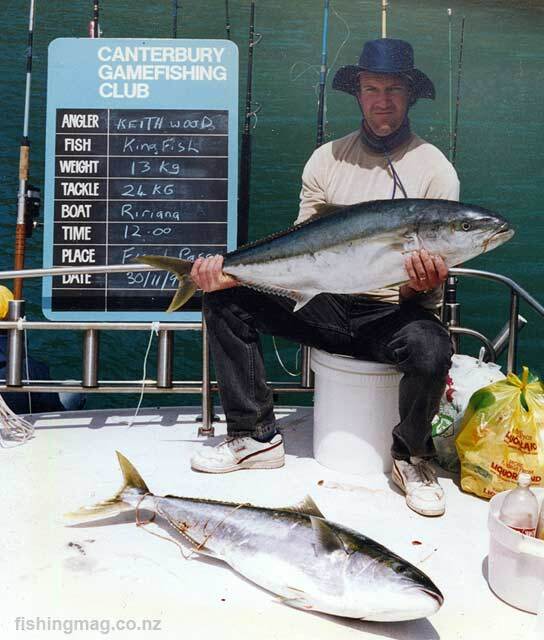 Mostly these big kingfish were hooked on jigs as the boats drifted through the pass at the speed of the current. This fish weighed 12.5kg (27.5lb). They are tremendous fighters and many would bust off on underwater obstructions. Do not bother shouting for help or looking around for the life ring or motoring back to him. ESTABLISH and MAINTAIN CONTACT WITH HIM IMMEDIATELY. Please behave courteously and treat others and the French Pass, D’Urville Island, area with respect. Good Fishing. A big kingfish taken on a jig in French Pass. 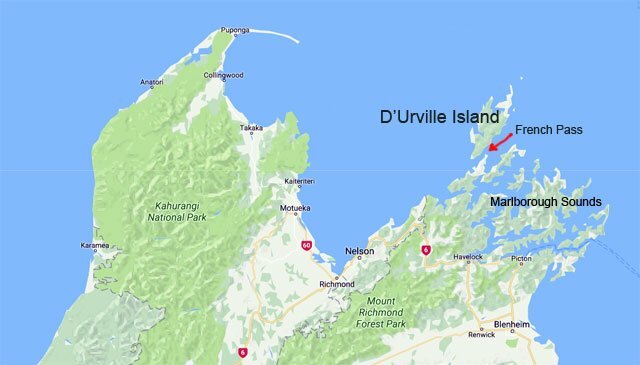 Map showing the location of French Pass between D’Urville Island and the upper South Island of New Zealand. Map courtesy of Google Earth.